The shift of power begins this weekend as more than 5,000 college students from every state in the U.S. unite to discuss global warming. 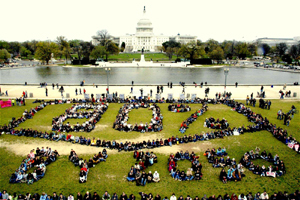 Power Shift 2007 is the first and largest youth climate summit in history. National Wildlife Federation’s Campus Ecology program is providing students with workshops that will help organize support on campus. NWF staff will also have a booth there to talk about programs students can engage in. Find out more on www.powershift2007.org. Also check out what NWF’s Campus Ecology is up to and read the Gristmill’s take on the weekend.